Welcome to Bali! 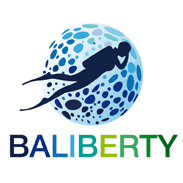 Welcome at Baliberty! Elise discovered diving in 2004 in French Brittany (a bit cold!). Reno began in 2006 on the Liberty wreck in Tulamben, here in Bali. Since then, we have continued to live our passion for diving, especially during numerous trips to South East Asia. We will train you to dive (Discover, PADI Open Water to Divemaster) or lead you as a guide for your aquatic rides if you are already certified divers. We trained nearly 900 divers and supervised over 2,000 dives. We’ll personally make you discover the gorgeous underwater wonders of Bali. Always amazed by the aquatic life and concerned with ecology, we will raise awareness in fragile balance of our oceans. We look forward, whether novices, beginners or experienced.